This evening I made a super quick and easy, delicious low carb meal. We had a particularly warm day here today with temps in the mid-80s which felt pretty hot after we were spoiled this past week with unseasonably cool and breezy days. We grilled burgers for dinner. I considered making a batch of my delicious Sesame Seed Sandwich Buns but I didn't feel like putting the oven on, so instead I sliced up the big wedge of Red Wax Hoop Cheese (which melts so beautifully) that I had picked up at Costco and placed a thick slice of it between 2 grilled burgers along with a couple sliced pickles. I melted another slice on top of the burger stack and added some sliced ripe Campari tomatoes and a generous squeeze of yellow mustard...and "ta-da" I had the most beautiful "Burgerwich" sitting in front of me. I didn't even miss the bread at all. 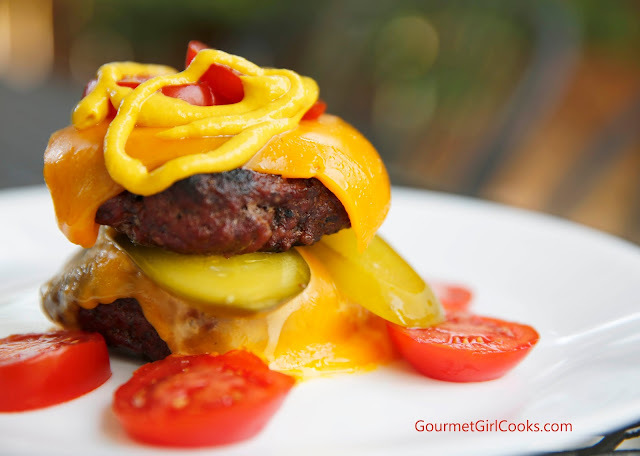 Now, if you prefer your burger on a bun, I have the perfect low carb bun recipe for you. You can find it here: Sesame Seed Sandwich Buns. I snapped a quick photo of my Burgerwich below. Enjoy! Our lovely spring weather came to an abrupt end. It got to 87 degrees today ... 87!! !